Find graphs that visualise post and story performance. Did you know EzyInsights has graphs that are accessible for any story within the tool? Firstly, open up the right hand info panel by clicking on any story. Each element inside the red outlines can be clicked to reveal a graph that reflects the engagement. These graphs represent the total Web Shares or Post engagement on a given story. How about for individual posts? 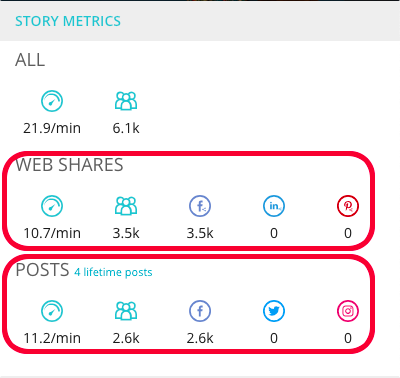 To access speed and engagement graphs for an individual post, again click on any story on your Ezy dashboard and open the right hand info panel. You'll see the post(s) related to the story nearer to the bottom of the panel. Next to each individual post there is a small arrow, click this. The graph for the individual post will appear. 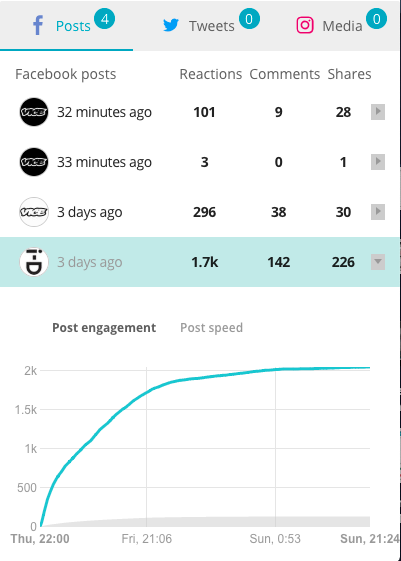 You can switch between engagement and speed to get an 'at a glance' view on how it is performing. The grey area is the average performance of a post on that page, the coloured line is the performance of the post in question. Here you can see this post is performing well above average. Graphs allow users to see any unexpected behaviour, for example if a post was performing averagely for a couple of hours and suddenly took off, you'll not only see it reflected here, but it will help you find an explanation.